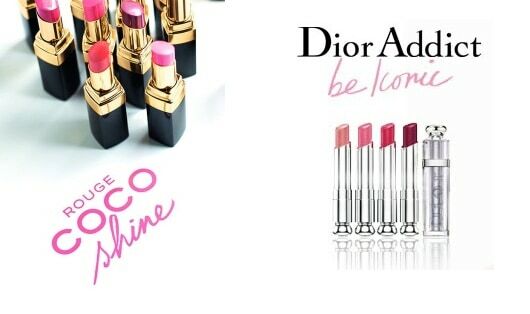 Home » Lips » Lipstick » Chanel Rouge Coco Shine and Dior Addict Be Iconic – Twin Ads separated at birth? Chanel Rouge Coco Shine and Dior Addict Be Iconic – Twin Ads separated at birth? But while I was looking around online, I could not help noticing how the ad for the Chanel Rouge Coco Shine and Dior Addict Be Iconic looked remarkably similar. Both share the same handwritten cursive font under the product name. A bit of a case of “Twins Separated at Birth”? 😉 Even the textures sound similar. Reading about both lipstick formulas send the spidey senses tingling even more. 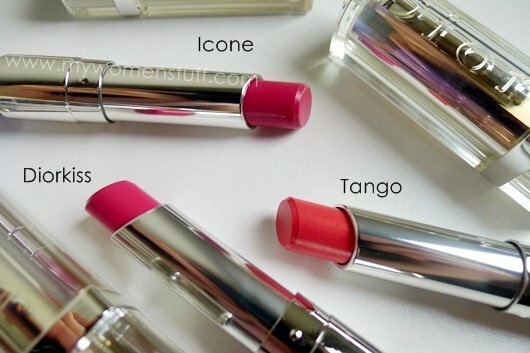 Both Chanel Rouge Coco Shine and Dior Addict are sheer and shiny lipsticks that apply like a lipbalm. They aren’t the only ones around having this formula for this season. Even Maybelline has jumped on that bandwagon. I so want the Chanel ones! Out of greed! I went to check out the Dior Addict with my friends, but the sheerness made me think twice. The lemming’s now nothing more than a nag, but yeah. I tried Diorkiss too!!! Should I get one?? Now the lemming’s back!! *Sees angpau in drawer, checks the amount of $$ inside* THANK YOU PB!!! Sheer glossy lips is love or hate. If Japanese style makeup isn’t your thing, you won’t like it. But in the Dior line there are some stronger colours too. Do you know which color is their bestseller? I like the one on Kate Moss but I think the color wouldn’t appear on my lips. hmm.. Boy was named after Coco Chanel’s love interest, a captain in the navy whose nickname was Boy… or something romantic like that 🙂 That’s the only one I know too but I think that’s one I know for sure I wouldn’t get, because it looks too light. Teehee… I’ll try to bring some swatches next week. They are proving to be a bit of a challenge to photograph!